Early adopters of electricity micro-generation are set to be kicked in the teeth, will miss out on decent new tariffs. If you feel that this is wrong, please sign the petition: We petition the PM and the Department of Energy and Climate Change (DECC) to reconsider its decision to place early adopters of alternative energy systems on a very poor Feed in Tariff rate. The new Feed-In Tarrif scheme is governed by the Department for Energy and Climate Change (DECC) and becomes operational on 1 April 2010. It pays varying guaranteed rates for electricity production, and this is over 30p/kWh for micro-generation schemes installed since 15 July 2009. If you have a pre-July-2009 installation, what are your options? The Energy Savings Trust has a page Clean Energy Cashback (Feed in Tariffs) which explains that an RO (Renewables Obligation) certified generator will qualify for a FiT tariff of 9p/kWh. Otherwise, they say to "contact Ofgem as soon as possible to ensure that you don�t miss out. 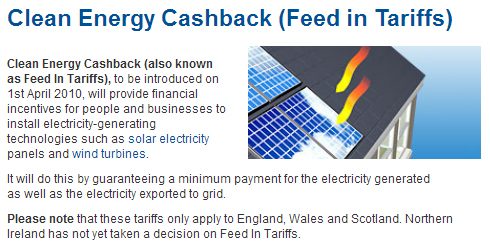 Installations in this category will receive a tariff level of 9p/kWh". However, the DECC website has a page Feed-in tariffs and a Microgenerators� FITs eligibility flowchart, which states that non-RO-certified installations do NOT qualify for a FiT tariff. It certainly looks like early adopters - the ones who have given brave forward-looking manufacturers a fighting chance to survive and develop - are being kicked squarely in the teeth. By the way, if you'd like information from Good Energy (an excellent domestic renewable electricity supplier) on how to generate your own electricity, visit Generate your own Good Energy - generateyourown.co.uk. Yes, we totally agree! And thanks for the kind words. We are also on the campaign to get this changed and if you are an old generator selling to us, we have guaranteed you the higher price.